It's not so much a big apple, as it is a bunch of little apples! The J. 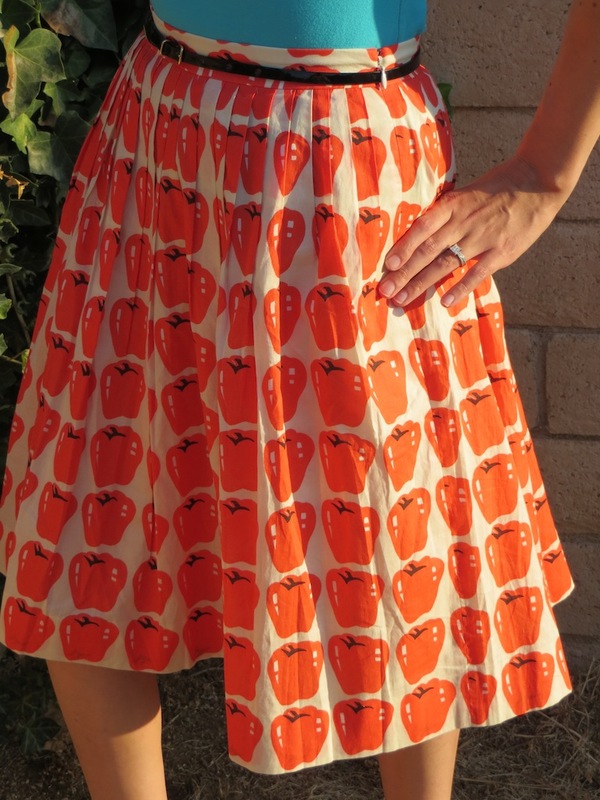 Crew Jardin skirt in delicious apples offers another, great quirky print to add to my collection. This summer J. Crew came out with a whole slew of apple themed skirts, shirts and even shoes. Although I really like this print, I do think the apples look a little bit like tomatoes! I paired this fun and quirky print with a patent leather J. Crew belt, which you have seen before and a turquoise color shirt from Target. T-shirts from Target are great, they really are. I have owned many of my T-shirts from Target for years and wash after wash they last. The true test of a great T-shirt. I wish I could say the same for knit wear from J. Crew. That's one area with major room for improvement for J. Crew. I have way too many patent leather shoes. These are probably my favorite for work. They are the patent leather Chris wedges from Kate Spade. They are very comfy because of the wedges and not too high. The perfect combination for work! What a fun print! I don't think my store ever got this so glad to see it on an actual person :). I love gap shirts too!